13 years after Falmer was identified as a potential site for the new home of the Seagulls, the dream became reality as the Seagulls moved into the American Express Stadium in 2011. The stadium is a classy looking structure. You notice very quickly that the club have gone to great lengths to avoid designing a soulless bowl. The 3 tier main stand is very impressive and has a line of executive boxes across the second tier. The north and south stands behind the goals are similar in that they are single tier affairs. The east stand has had a second tier added but the gradient remains very good making for an excellent view from all over the stadium. 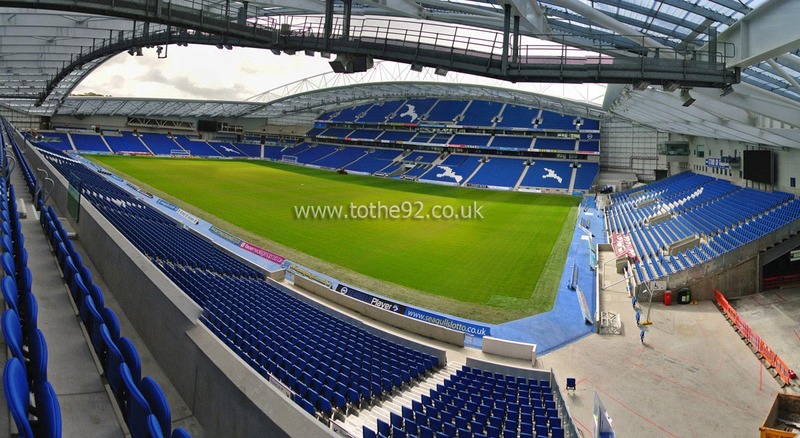 Away fans will be housed in the south east corner of the stadium where approximately 3,300 fans can be accommodated. The views from within these sections are fantastic and the leg room is ample as would be expected for a new build. One thing you may not expect but will find as a bonus is the padded seats! There are a number of pubs in the close vicinity. Recommended by Sussex University students is The Hikers Rest (BN1 9GD) which has sky sports and a lovely garden to sit out in with pre match drink and is only approximately half a mile away. A little further afield is The Swan Inn (BN1 9PD) which is a more traditional pub. Also has Sky Sports on tv's around the pub but there's a very relaxed feeling about the place. I guess that may disappear once 1200 away fans set upon it on a Saturday afternoon though! A more popular option tends to be to head in to Brighton for pre game drinks and simply use the free travel from your match ticket to get the train along closer to kick off. Bridge car park, has the capacity to accommodate up to 650 cars. However, it will fill up quickly and will be around £10 per car so get there early or more preferably book in advance through the club. Parking elsewhere in the local vicinity is very hard to come by. An option is to use the Albion park and ride service from Brighton racecourse. Another thing to remember is that included in your matchday ticket is a travel voucher which allows fans to ride the buses and trains throughout most of Sussex on a match day. The most popular option being visiting fans going in to Brighton pre match, and then get the train to the stadium. It's all very well organised now and plenty of fans who don't live close to a railway opt to park in outlying areas (Lewes, Haywards Heath, Shoreham, Worthing etc) and use the public transport to the ground. Falmer railway is the station for the University of Sussex and is the closest / nearest station to Brighton & Hove Albion's American Express Stadium and is only a stones throw away. Trains run every 15 minutes from London Victoria and the journey time is approximately 75 minutes. Travel: Train from Surrey. No problems as the station at Falmer is attached to the walkway round the ground by a bridge. Refreshments: Didn't have time to visit pubs, though being a Palace supporter I may have been unwelcome. Impressions: Beautiful but characterless stadium. Atmosphere for the derby match as good as it gets in Legoland environment. Facilities: Toilets were fine, plenty of legroom within the stadium (although nobody sat) and great views of the game. Much too nice for the home supporters. Bar ran out of beer and poor girl working there was besieged whilst her colleague went to sort things out - but he never came back. Exit: Terrible getting away. If using the station the queue is about 45 minutes long - completely inadequate and plenty of opportunities for rival fans to get upset with one another, which they did. Enjoy: Brighton's first defeat at the Amex at the hands of their fiercest rivals made for a great summer evening out as a Palace supporter. Recommended. Travel: Don't drive there unless you have a 'paid for' space waiting for you! The ground is surrounded by a parking permit ring of steel the likes of which I've never seen! And given the queues for the train back to Brighton, parking at Lewes and getting the train from there is good advice to heed. Still a massive queue there too, but nowhere near as bad as heading back into the city. If you can go via Lewes on the train rather than Brighton, do it! The only upside to the transport chaos is that public transport is free with a match ticket (or proof of purchase if you're collecting your ticket on match day) in a wide area around the ground on match days. Refreshments: There are plenty of places to eat and drink near Brighton or Lewes Stations, not a lot near the ground, but the stuff in the ground is very good if that's what you're stuck with. The pies are pricey (probably no more than most other football grounds these days I suppose), but absolutely to die for. The bars at the ground also remain open long after the game, in an effort to alleviate the transport chaos mentioned above. Impressions: Its not even been there 2 full seasons yet, but has already had plenty of changes made with the capacity raised. The two ends are small single tiers that are dwarfed by the two much bigger sides. 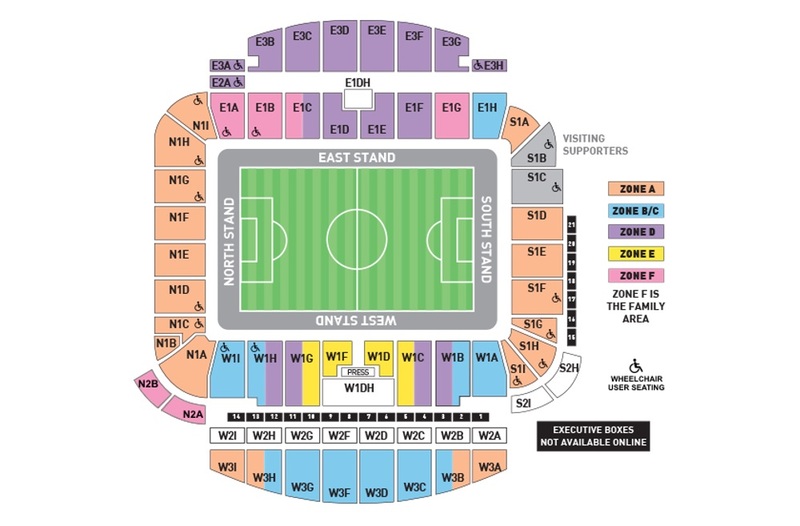 The two tiered East Stand on one side, and the bigger three tiered West Stand, which is reminiscent of a bit of a mix between Chelsea'’s West Stand with the small middle tier, and Manchester City’'s two side stands with the rounded top tier. Lovely ground to look at from the inside, only criticism is its a bit dull on the outside with no real big frontage. The ground also has the nice small padded seats they have at MK Dons, and a big screen behind each goal. Atmosphere: Really good, even when it was only a few singing in the North Stand, it felt very noisy, so good acoustically. Enjoy: The transport dependency spoils what is otherwise a good day. The ground itself is up there with MK Dons and Man City as the best of the new build stadium generation by a mile. 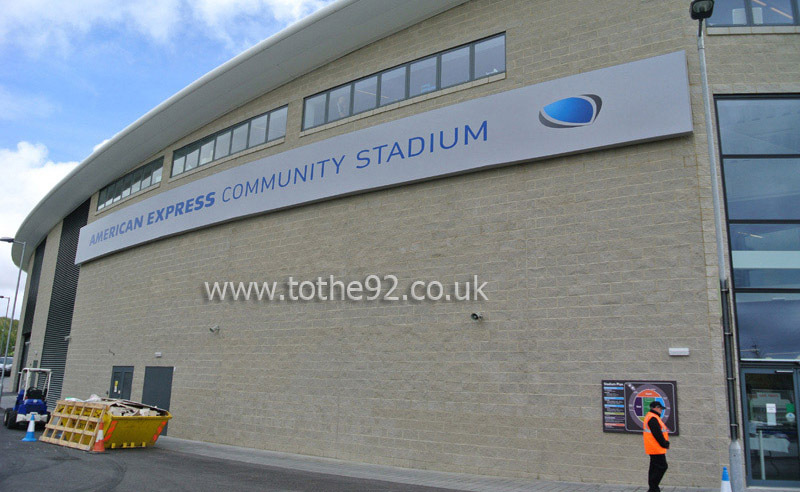 Have you been to Brighton and Hove Albion's American Express Stadium? To tell us about your experiences and to feature on the site, simply complete the fans review form below!